The funeral home covered in sigils in 4.15 Death Takes a Holiday. Dean: And the Enochian exorcism? Castiel: Fake. It actually means "You breed with the mouth of a goat." Castiel: It's funnier in Enochian. Enochian is an angelic language with which angels communicate in Heaven. The language is often used for spells that affect angels. Enochian sigils are powerful glyphs. They can be used to bind demons, protect an area from angelic and demonic interference, and conceal humans from "every angel in creation." The Whore of Babylon uses what appears to be an Enochian spell to harm Castiel. Lucifer's Cage can be reopened with the rings of the Four Horsemen of the Apocalypse and an Enochian phrase. The script for Hell Hazers II: The Reckoning by Walter Dixon is noted by Sam to contain Enochian summoning rituals. Alastair is trying to break one of the 66 Seals by killing two reapers under a solstice moon. He holds the reapers in a funeral home covered in "angel-proofing," symbols that bar angels from entering. Castiel and Uriel have bound Alastair to a devil's trap which is described as being old Enochian. X-ray of Dean's ribs inscribed with sigils from 5.02 Good God, Y'All. Castiel engraves Enochian sigils into Sam and Dean's rib cages. He tells them they will hide the boys from all angels, including himself and Lucifer. As a result, Castiel is often seen contacting Sam and Dean via a mobile phone afterwards. 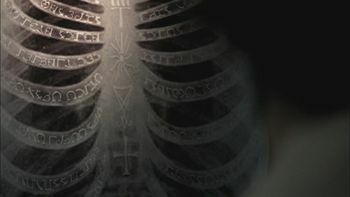 While visiting Bobby in the hospital, Dean has an x-ray which reveals the sigils on his ribs. Their success in protection is also demonstrated when Castiel has to call them to get their location so he can find them. Partial translation of the sigils by bloggingchick. Castiel summons Raphael using the Enochian Water Cup Ritual. Zod itself has many definitions and one of the words for vessel is ZIZOP (zohdee zodoh pah)- but I feel it's implied at the end here. Either that or they were going for ZA (zoh-dah) which translates to "within." Crowley's house covered in sigils. Crowley's house is protected from angels by Enochian symbols. 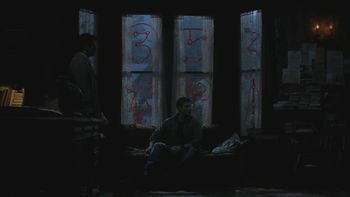 The Winchesters still have the Enochian symbols burned into their ribs, which prevent Anna from locating them, so she must approach Dean in a dream. Castiel performs a ritual in Enochian to locate Anna. Sigils on the hearts of victims indicate that Cupid has touched the people. In Heaven Ash has rigged a PC to monitor angels as they speak Enochian by using string theory. Ash also says he understands Enochian. As a ruse to fool the townspeople, the Whore of Babylon, disguised as Leah, enlists demons to make controlled attacks on Blue Earth, Minnesota. The Whore teaches the townspeople an Enochian "exorcism." but Castiel reveals that it actually means "you breed with the mouth of a goat." The Whore attacks Castiel with an Enochian chant. Castiel burns Enochian runes into Adam Milligan's ribs to hide him from the angels who resurrected him. Zachariah uses an Enochian incantation to summon Michael to Earth. Crowley squats in a rundown house that has what appear to be "angel-proofing" sigils on its windows. Dean uses an Enochian incantation revealed to him by Death to open Lucifer's Cage. Dean says "Bvtmon Tabges Babalon" (which roughly translates "Open the mouth of the cave of the evil/wicked one") and the cage opens, but Lucifer shuts it by chanting a counter spell. Later in the episode, Sam uses the same incantation. literal translation "Mouth cave and wicked one"
Cas finds Dean and Sam despite the Enochian symbols burned into their ribs. This may or may not be because they called him. He uses an Enochian ritual with myrrh, holy water, and human (Dean's) blood to locate Balthazar. Cas conducts a ritual involving herbs and candles in an attempt to locate Crowley, but is unable to find him. Balthazar draws an angelic rune that, once activated, sends Dean and Sam into an alternate Earth. Injured, Castiel retreats to Bobby's place and draws a sigil in blood, warding off other angels. Protective sigils at Bobby's place. After discovering that Cas is in league with Crowley, Sam, Dean, and Bobby put "angel-proofing" sigils on the windows of Bobby's place to keep him out. There are errors in their work though, as Castiel is able to enter. After Castiel removes the barrier in Sam's mind that keeps him from remembering his time in Hell, Sam is unconscious. Dean and Bobby lay him on a cot in Bobby's panic room to make sure he's safe while they go to confront Crowley and Castiel. In light of Castiel's actions, "angel-proofing" sigils are added to the walls of the panic room, and Balthazar confirms that the symbols are accurate and keep him from entering. After traveling to Rufus's cabin, Castiel puts sigils on the walls that make them invisible to angels, but doesn't put up ones that block angels out completely as he wouldn't be able to enter either. Their effectiveness is destroyed when Meg leaves to kill two demons and thus gives away their position. These symbols are seen in later episodes. In the abandoned factory where he is holding Samandriel captive, Crowley puts up Enochian sigils that block angels from sensing Samandriel's location or entering the factory. After he and Dean locate it, Castiel sends Sam and Dean in with instructions to destroy a specific sigil in four locations in the factory so he may enter. 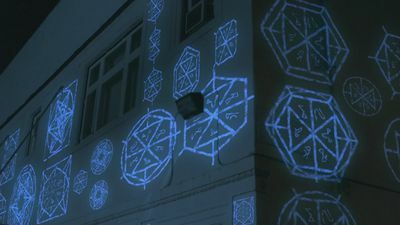 Locating the sigils, they spray-paint giant Xs over them, allowing Castiel to enter, but he is weakened by the other sigils. At the same time, when Samandriel is reverted to his "factory setting" by Viggo's torture, he starts speaking in Enochian which Crowley understands; he speaks of the Word of God tablets, including one on angels, before he is rescued. Later, suspicious of Castiel's behavior, Sam and Dean put up more sigils at Rufus' Cabin including the one Castiel showed them so he couldn't see or hear them while they discussed what happened. LVSD is the closest word I could find here and it means feet, therefore - mighty feet? However- I think they were actually going for PATRALX which translates to "stone"
Henry Winchester uses an Enochian invocation as part of the blood spell to transport him to the future. Enochian spell from 8.14 Trial and Error. Sam and Dean learn from Kevin Tran that in order to close the Gates of Hell, someone must complete three trials and recite an Enochian spell after each one. After completing the first trial by killing a hellhound, Sam recites the spell. It is also shown that Sam and Dean are able to read Enochian as the spell is written in that language. Again, the first part here is made out of partial words. Oh-meh (which is written OM in Enochian) translates to "understanding" or "knowledge"
Now for the interesting part- DARR has only one translation and that's "philosopher's stone"
however, DARBS Dar-bess is "obey." After finding the right crypt, Sam and Meg demon-proof the building with Enochian symbols, but when Crowley shows up, he tells them the symbols won't keep him out for long. This is later proven when he gets into the crypt. After rescuing Bobby Singer's soul from Hell and releasing it into Heaven, Sam chants Kah Nah Om Dar again to complete the second trial. Freaking out over hearing Crowley's voice in his head, Kevin paints Enochian demon-warding symbols on the windows of Garth's houseboat, but when Crowley arrives, he simply shatters the windows and the symbols, allowing him in. Other Enochian symbols can be seen throughout the boat's main room during the episode due to Kevin's paranoia. When Crowley leaves with Kevin, he fixes the windows and thus the symbols so it looks like Kevin just ran away. Angel warding in Sam's hospital room. After capturing Kevin Tran, Crowley puts up Enochian angel-warding to prevent angels from rescuing him. However, the angelic scribe Metatron manages to do it anyway and later explains to Dean that as the Scribe of God, he was able to simply erase the wards. Learning that angels are coming to the hospital to try to find Castiel for revenge, Dean puts up Enochian warding on Sam's room that keeps them out, though it allows Ezekiel to remain in. Dean takes on the two angels that show up, but they overpower him and use a fire axe to start chopping through the room door which has some of the warding on it. 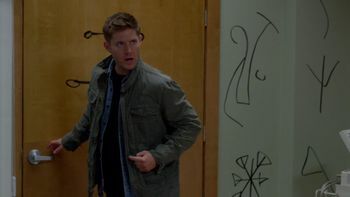 Dean banishes the angels and then starts to destroy the symbols himself when Ezekiel reveals he is too weak to heal Sam. Eventually, with Ezekiel possessing Sam, they leave, leaving Ezekiel's original vessel in the room filled with symbols. After Dean and Ezekiel/Sam leave, a doctor enters the room and is confused by the symbols. After Castiel becomes aware that angels are hunting him, he gets a tattoo in Enochian which will make him unable to be tracked by angels. It is very effective, forcing Bartholomew to use rogue reapers to track him. Searching for answers about why Sam still has some of Gadreel's grace inside of him, Castiel finds a book in the Bunker that basically states in Enochian that part of the angel remains inside their vessel when they leave it. He realizes that this refers to the grace, but it is harmless to the vessel. After failing to locate Magnus' mansion, Abaddon has her demons carve a message into the side of the Impala in Enochian for Crowley, which reads: "Be afraid - your Queen." Sam and Dean spray paint the building they are keeping Gadreel prisoner in with angel warding. Angel warding can be seen painted on the door to Ezra's "prison cell." Angels, claiming to be followers of Castiel, have taken to suicide bombing rival angels by carving Enochian runes in their chests that focus the energy of the angel. Once fatally stabbed with an angel blade it unleashes all the angel's power, effectively atomizing their intended target. While searching for the angel Josiah, Sam and Castiel end up at an abandoned building where all the entrances are sealed with a riddle written in Enochian over the front entrance. Once it is solved, they are granted entry into the building. Gadreel carves the same sigil the suicide bomber angels used into his chest and then kills himself, sacrificing himself to blow open Castiel's cell in Heaven's dungeon so he can escape and stop Metatron. The angels Daniel and Adina's truck and campsite have been adorned with Enochian warding sigils to hide them from other angels attempting to force them back to Heaven. Metatron uses an Enochian blood spell to incapacitate Castiel. The abandoned building Sam imprisons Rowena in has warding sigils spray painted on the windows, most of which appear to be Enochian. Ms. Watt gets her brass knuckles ready for a fight. Believing Donatello Redfield to be a new prophet, Sam shows Donatello a piece of paper with Enochian. Donatello initially tells Sam he has no idea what the paper says before surprising himself by reading "Behold the face of God." 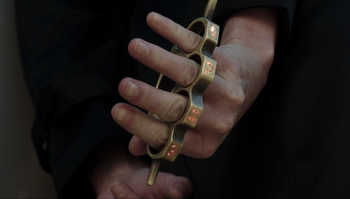 When Ms. Watt confronts Dean and Castiel, she is wearing brass knuckles with Enochian spellwork etched into them. With Metatron's spell still in effect, Castiel's weakened state makes him all the more vulnerable to the spellwork, allowing Ms. Watt to make short work of Cas and Dean. After capturing Dean Winchester, Lady Toni dons her own pair of Enochian brass knuckles and begins to beat Dean with them. Lily Sunder spent over a century honing Enochian magic. Using this type of magic comes with a price; with each use a piece of Lily's soul burns away and will continue to do so until there is nothing left. Kevin Tran of the Apocalypse World performs an Enochian spell which opens a new rift between the two Earths. Kah day, em lah! Kah day, em lah. To keep Castiel and Lucifer imprisoned in Needham Asylum, Asmodeus has put strong angel warding in place in their prison cells. The Enochian script becomes highlighted as Lucifer makes contact with the cell bars, causing him immense pain. To summon Gog and Magog, Castiel recites an Enochian incantation. oh ee vee ah ee, ee duh luh vah juh ah um kah dah. Boh ray, kah lah teh nee hoh. Rah may lah ray kee doh. Castiel is able to translate this phrase as "I will strike down the firstborn in the land of Egypt. I will execute judgement." Enochian is a name often applied to an occult or angelic language recorded in the private journals of Dr. John Dee and his seer Edward Kelley in the late 16th century. The men claimed that it was revealed to them by angels, while some contemporary scholars of magic consider it a constructed language. The term is derived from the Biblical Patriarch, Enoch or Henoch. Enoch was, according to Hebrew folklore, the most righteous man of his time. Two angels appeared to him one day, claiming to have fathered children with mortal women. They asked Enoch to speak to God on their behalf. In order to speak to God, the angels took Enoch up into Heaven, where he took down secrets of the universe and how angels used their magic and transcendent powers. God, unconvinced of the renegade angels' sincerity and remorse, sent a flood to destroy the angel halfbreeds and banished the angels from Heaven. Enoch was returned to earth with his newfound knowledge of magic and the summoning of angels and spirits. At the age of 365, Enoch was visited by God and transfigured into God's most powerful and fiery angel, the High Seraph Metatron, and taken into Heaven to serve as God's chief angel. The Enochian language was in reality invented by occultist John Dee.